Travel from West to East and back again in this spectacular cruise and rail voyage across Australia. Cruise from coast to coast along southern Australia. Explore the historic Blue Mountains & Jenolan Caves. Indulge in fresh produce in the Hunter Valley. Enjoy the amazing journey aboard the Indian Pacific from Sydney right through to Perth from the comfort of your private cabin. 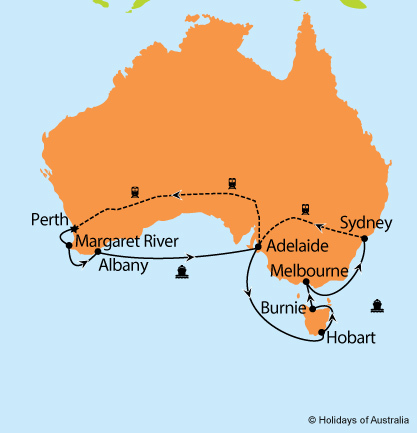 11 nights aboard Sea Princess cruising from Fremantle to Sydney with port calls in Margaret River (Busselton), Albany, Adelaide, Hobart, Burnie and Melbourne. Includes on board meals and entertainment. Transfer from the cruise terminal to your accommodation including half day Sydney City Sights tour. 6 night stay in Sydney at Sir Stamford Circular Quay including breakfast. Full day Blue Mountains & Jenolan Caves tour. Full day Hunter Valley Harvest Wine Experience tour. 3 nights aboard Indian Pacific travelling from Sydney to Perth in Gold or Platinum Service. Your journey includes all meals, drinks and off train experiences in Broken Hill, Adelaide, Cook & Nullarbor.